Stephen Girard arrived in Philadelphia from France in 1776 while working as a sea captain. By his death in 1831, he was one of the wealthiest men in America. Girard was born in France and received little formal education, but showed innate skills in business and seafaring. He first apprenticed on a ship at age fourteen and was promoted to captain less than ten years later. While Girard moved goods between the West Indies and New York, the British Navy blockaded the colonies, forcing Girard to sail to Philadelphia instead. He chose to settle in the city and amassed a great fortune as a banker and a merchant. Girard was heavily involved in philanthropic efforts. During the devastating yellow fever epidemic of 1793, he established an emergency charity hospital, going so far as to transport the ill in his personal carriage. He is credited with saving the United States from economic catastrophe during the War of 1812 by investing nearly his entire fortune in government bonds. At the time of his death, his bequest was the single largest act of charity in America. Two million dollars of Girard’s bequest was earmarked for the establishment of a school for poor orphaned or fatherless white boys. Construction on the main campus building, Founder’s Hall, commenced in 1833. 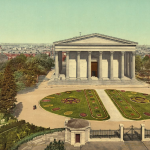 The lead architect was Thomas Ustick Walter, who designed a monumental Greek Revival building in the center of the school campus. Construction took nearly five years. In September 1849, the first class of Girard College students attended classes in Founder’s Hall. When completed, it was the second-most-expensive building in the United States after the U.S. Capitol—the dome of which was also designed by Walter. In the twenty-first century, Founder’s Hall was being used as a student activities center and home to the school’s archives. Stephen Girard’s city land holdings were often converted into row-house developments using funds from his bequest. 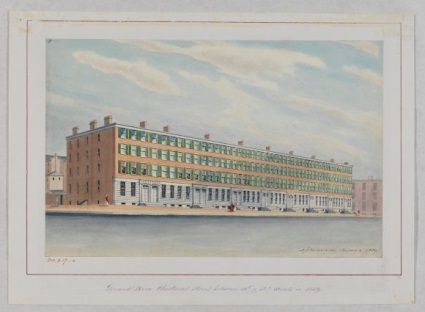 These developments were popularly referred to as “Girard Row.” The series depicted here was completed in 1837 on Chestnut Street between Eleventh and Twelfth Streets. It became home to a community of piano repair shops and vendors and was referred to as Piano Row. The homes were demolished in the 1930s. A similar row of Girard-funded homes still stands on Spruce Street in the Society Hill neighborhood. Girard College was not the only school that owed its existence to Stephen Girard. Girard’s will also established a school on land he owned in what is now known as the Girard Estates neighborhood of South Philadelphia. Prior to the Act of Consolidation of 1854, the neighborhood was part of Passyunk Township. The school was built in 1833 at Nineteenth and Passyunk Streets, a short distance from Girard’s country estate, Gentilhommiere. Six thousand dollars was willed for its construction. The school struggled for its first years and was closed in the 1860s. The City of Philadelphia bought and reopened it as a public school in 1867. In the late nineteenth century, the school had outgrown its original building and was moved to a new building on a nearby lot. 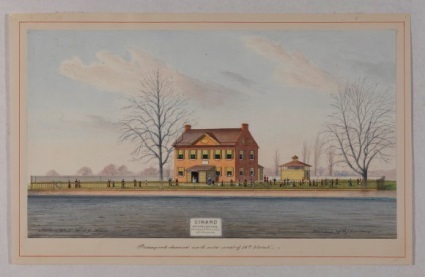 Businessman Stephen Girard’s primary residence and office was on Water Street along the Delaware River. From this vantage point, he could watch commerce on the river—and see that improvements were needed. On his death, he bequeathed $500,000 to the improvement of Delaware Avenue, then a foot path just east of Water Street. Between 1834 and 1845, the path was expanded to a street paved with Belgian block and lit by gas lamps. 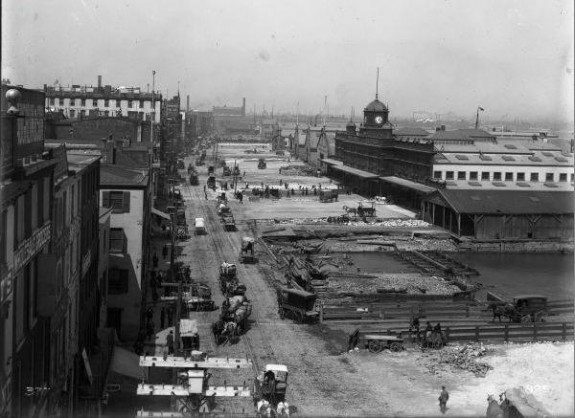 As a result, waterfront commerce boomed and the avenue was expanded twice in the nineteenth century. It became an important corridor for both freight and passengers bound for the Delaware River ferries. To that end, a freight train line commonly referred to as the Belt Line, and the Ferry Line, an extension of the Market-Frankford Elevated, were constructed down Delaware Avenue. The latter was discontinued and demolished in 1939 after the construction of the Benjamin Franklin Bridge made the ferries obsolete. In the 1990s, the street was repaved and landscaped. A portion of it was renamed Columbus Boulevard in 1992 to honor the five-hundredth anniversary of Christopher Columbus sailing to America. Girard’s will specified that Girard College be reserved for the exclusive education of white boys. Though the law allowing segregation of public schools in Philadelphia was overturned in 1881, private schools like Girard were not affected. In 1953, during the height of the desegregation movement, black lawyers such as City Councilman Raymond Pace Alexander tried to desegregate Girard College by arguing that the school was administered by a public agency and tax exempt. 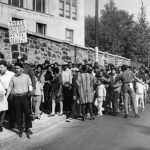 In a U.S. Supreme Court decision in 1957, Girard College was ordered to desegregate, but instead, the lower courts appointed a new board of directors in an attempt to make the school a fully private entity. 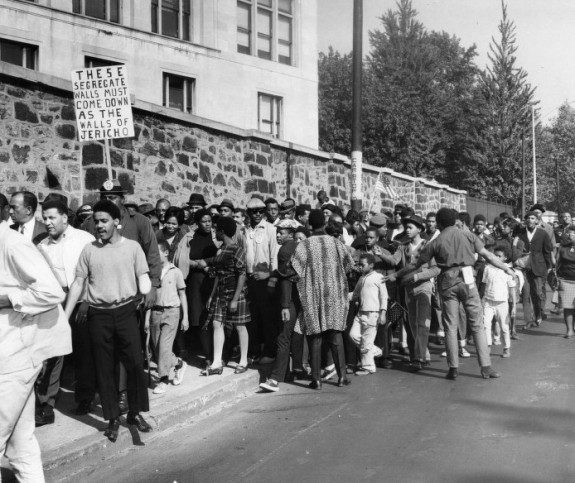 Local NAACP President Cecil B. Moore revived the desegregation effort in 1965, this time taking to the streets (as seen in this photograph) instead of the courts. Beginning May 1, Moore led a picket line outside the school demanding black male students be admitted. The protest was joined by prominent civil rights activists including Martin Luther King Jr., who spoke in front of a crowd of demonstrators in August. Finally, the first black students were admitted in September 1968. Female students were not admitted until 1984. On December 26, 1831, the richest man in the United States died and gave the city of Philadelphia the great majority of his fortune. 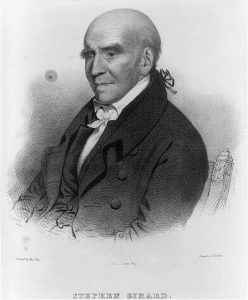 Committed to philanthropy for much of his life, Stephen Girard (1750-1831) had wealth at the time of his death estimated at more than $6 million, earned during his life as a merchant and banker, from his investment in internal improvements like the Schuylkill Navigation Company, and in real estate in Philadelphia and beyond. Having no biological children as heirs, Girard left some of his fortune to his extended family. However, with the majority of his estate Girard invested in Philadelphia’s physical infrastructure with the intention of making it cleaner and healthier and in the city’s most impoverished citizens with the intention of making them more productive members of society. Drafted with the help of attorney William J. Duane (1780-1865), the twenty-six sections of Girard’s will covered thirty-five pages, plus a page-and-a-half codicil. Right away, Girard made clear his commitment to philanthropy. 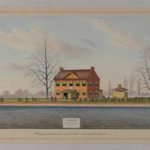 He dedicated the first eight sections of the will to established institutions in Philadelphia, like Pennsylvania Hospital, as well as those he intended to establish, like a school in Passyunk Township. Among other charitable bequests, he set aside money to be held in trust to provide fuel to help keep Philadelphia’s struggling citizens warm in the winter. The middle part of the will set aside notably smaller bequests to Girard’s extended family and individuals who served in his household, but then its final sections meticulously explained how the bulk of Girard’s immense estate should be handled. Much of the money for these more substantial bequests derived from Girard’s extensive real estate holdings. For instance, the will stipulated that Girard’s property in Louisiana was to be held in trust jointly by the Corporation of the City of New Orleans and the mayor, alderman, and citizens of Philadelphia, and his real estate in Kentucky was to be sold, the proceeds to be used to accomplish Girard’s philanthropic goals. The most notable section of Girard’s bequest provided funds for the “Orphan Establishment” that became Girard College. With two million dollars, the largest single sum bequeathed in the will, Girard instructed the city to establish a school for “poor white male orphans.” The will explained precisely how and where each building should be constructed, detailing dimensions and materials. Construction of the College began in 1833 and the school admitted its first students in 1848. To accomplish his other main goal—making a cleaner and healthier city—Girard dedicated $500,000 to improve the area of the city along the Delaware River, resulting in the construction of Delaware Avenue. Girard also foresaw the practical and legal challenges that his bequest would create. For the city to effectively inherit his fortune, it would need to establish committees and accounts to manage and safeguard his investments, and for that the city would need the help of the state. To ensure cooperation, Girard bequeathed $300,000 to the Commonwealth of Pennsylvania for internal improvements (intended for canals), but only to be paid after laws were passed to implement the other improvements for Philadelphia. In so doing, Girard created an extra incentive for the state and the city to cooperate. Such cooperation was easier planned than accomplished. Girard’s bequest required the coordination of authorities at city, state, and national levels. This was no easy task and debates over how to manage the estate consumed significant time and energy within Philadelphia’s city government throughout the mid-nineteenth century. Additionally, the comparatively smaller bequests set aside for family members left Girard’s extended family feeling snubbed. Their challenges to the will made it to the Supreme Court of the United States. Justice Joseph Story (1779-1845) wrote the opinion in the case Vidal et. al v. Mayor, Alderman, and Citizens of Philadelphia (1844) that upheld the will and set new precedent for trust and corporate law. With this decision, Justice Story cemented the right of corporations not only to inherit real and personal estate, but also hold it in trust just as a citizen could. Girard’s will reached the Supreme Court again in the twentieth century in the aftermath of Brown v. Board of Education (1954), this time challenging the stipulation that Girard College admit only white boys. In the case Pennsylvania, et al. v. Board of Directors of City Trusts of the City of Philadelphia (1957), the Trustees of Girard College argued that the will was inviolable, but this time the Court disagreed. Girard College was eventually desegregated in 1968; the first female students enrolled in 1984. After large expenditures for the construction of Girard College and Delaware Avenue, the value of the Girard Estate grew throughout the nineteenth and twentieth centuries, deriving income largely from investments in coal lands in Schuylkill County. Managed by Philadelphia’s Board of Directors of City Trusts, established in 1869, in the twenty-first century the Girard Estate continued to derive assets from investments and real estate in greater Philadelphia with the primary purpose of funding the continued operation of Girard College, which maintained the educational and philanthropic mission of Stephen Girard. Girard’s bequest, the largest trust given to the city, built on an already long history of charitable giving in Philadelphia that began with Benjamin Franklin and others in the eighteenth century. The lasting value of this foundational gift cemented Girard’s charitable legacy and raised the bar for philanthropy in the City of Brotherly Love. Brenna O’Rourke Holland is Visiting Assistant Professor of History at the University of the Sciences in Philadelphia. She earned her Ph.D. in history at Temple University. Her dissertation, “Free Market Family: Gender, Capitalism, and the Life of Stephen Girard,” is a cultural biography of Philadelphia merchant-turned-banker Stephen Girard that interrogates the relationship between family and capitalism in the early American republic. Brown, Steven P. “The Girard Will and Twin Landmarks of Supreme Court History.” Journal of Supreme Court History 41 (Mar. 2016), 7-20. Duane, Russell and Daniel Webster. “Who Wrote Stephen Girard’s Will?” The Pennsylvania Magazine of History and Biography 54 (1930), 1-31. Ferguson, Robert A. “Charity in the City of Brotherly Love.” In Reading the Early Republic, pp. 234-253. Cambridge, Mass. : Harvard University Press, 2004. Ingram, Henry Atlee. The Life and Character of Stephen Girard, of the City of Philadelphia, in the Commonwealth of Pennsylvania, Mariner and Merchant. With an Appendix Descriptive of Girard College. Philadelphia: E. Stanley Hart, 1885. Kyriakodis, Harry. 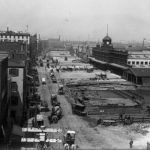 “200-Plus Years of Transforming Girard Square.” Mar. 16, 2016. HiddenCityPhila.org. Laverty, Bruce, Michael J. Lewis, and Michele Taillon Taylor. 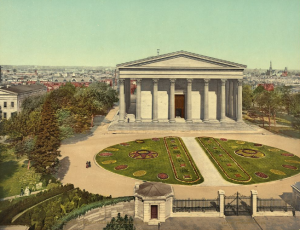 Monument to Philanthropy: The Design and Building of Girard College, 1832-1848. Philadelphia: Girard College, 1998. Roeber, A. G. “The Long Road to Vidal: Charity Law and State Formation in Early America.” In The Many Legalities of Early America, 414-441. . Edited by Christopher L. Tomlins and Bruce H. Mann. Chapel Hill, N.C.: University of North Carolina Press, 2001. Walter, Thomas U. A Description of the Girard College for Orphans, Contained in a Final Report of the Building Committee to the Select and Common Councils of Philadelphia, A Report to the Building Committee. 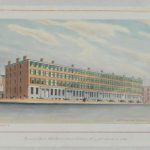 Philadelphia: Crissy & Markley, Printers, 1848. Woodall, Martha. “Judge: Girard must remain a boarding school, keep high school programs.” Philadelphia Inquirer, Aug. 27, 2014. Girard College History Collections, Girard College, 2101 S. College Avenue, Philadelphia. Stephen Girard Papers, American Philosophical Society, 104 S. Fifth Street, Philadelphia.